Few things are as beautiful as a wild backcountry trout. Their colors, their willingness to rise, and the places they call home are all worth the effort it takes to find them. Waking up at 4am, putting miles on the boots, sleeping on the rocky ground, getting caught in a hail storm with no trees to duck beneath. It’s all worth it for some to have a chance at a fish that may only be a few inches long. Many would even go as far as saying that extreme discomfort is mandatory. A trout looks and feels finer with more obstacles in its way. The reason we’ll climb a tree for a fly that costs $1.50 or cross a stream on a log when there’s a bridge accessible. Because most fishermen seek out these hardships on streams, beautiful lakes often get overlooked. 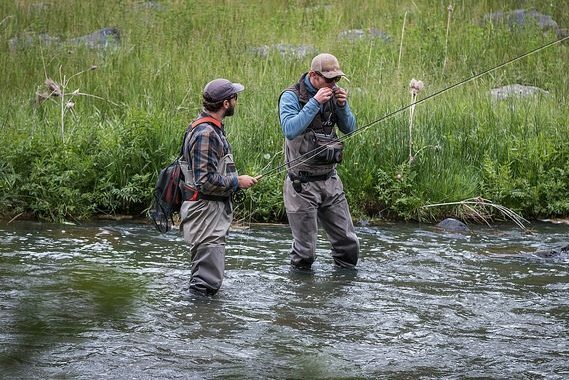 These hidden gems, often above treeline, offer some of the best backcountry fly fishing to be had. They usually hold healthy populations of trout that are eager to take a dry fly, and are relatively simple to fish. 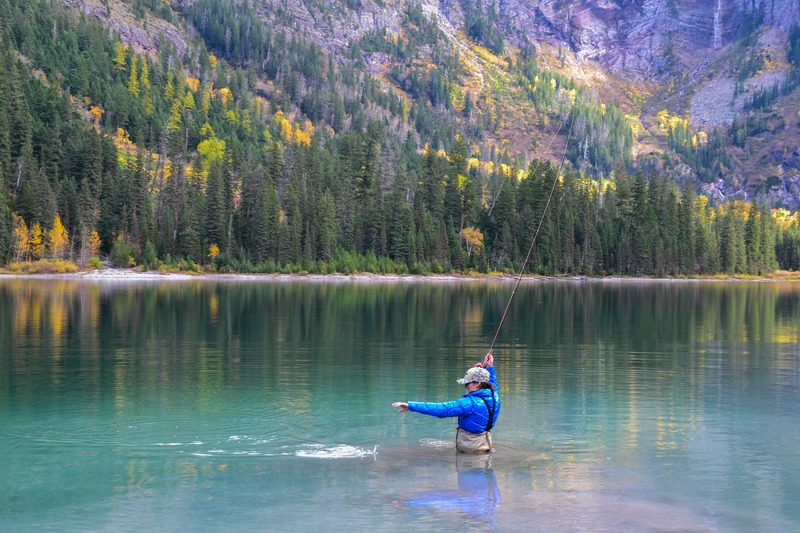 Here, we’ll go over nine ways to have better success fly fishing in backcountry lakes. One of the best things about backcountry lakes is that you can usually walk the entire perimeter. With no need to worry about private property along the shore, and very little chance of competing for water with other anglers, it’s often possible to cover the whole lake during a day of fishing. Lakes above treeline make this even easier, as there’ll be no obstacles to worry about while casting. The key here is to not get sucked into a single spot when you’re catching fish. It can even be easy to get locked in when you’re not catching fish, as the water will often be clear enough for you to see them swimming. In the case of catching, it’s important to remember that you can fish a spot out, or at least slow it down. On many of these lakes, there’s a good chance you’ll get a fish to take your fly on the first cast, and possibly the second and third as well. Eventually it will slow down, but because you’ll still probably be hooking the occasional trout, you might forget the fact that half an hour before, you couldn’t keep the fish off your line. Being diligent about switching things up can keep the fishing fresh and allow old spots to recharge. In the case of not catching fish, moving might just be the fastest way to change your odds. I’ve been on lakes where one side seems lifeless while the other is bubbling with rises. And further, there’s a very high likelihood that this phenomenon will move around the lake throughout the day. If you’re not finding luck where you are, the simple answer is to go find the luck. It’s probably waiting for you just across the lake. I know this post is about lakes, but it would be irresponsible to not mention inlets and outlets here. Inlets, where water is flowing into a lake, and outlets, where water is flowing out of a lake, are some of the best areas to toss a fly. Try fishing in the lake near these areas and also in the moving water itself. Fish will congregate in the stiller lake water and gorge on insects as they flow past. In a large lake with little structure, finding these concentrations of fish can be crucial. The streams themselves also provide ample opportunity, as they are often narrow and will squeeze a lot of fish into a tight space. Drifting a fly down the channel will be hard for these fish to resist, and you will likely be able to hook several. These spots are also a go-to in the early season just after ice-off, when the rest of the lake hasn’t quite “woken up” after winter yet. I find that the inlets and outlets are usually the first places to start fishing well when there is still snow in the area. 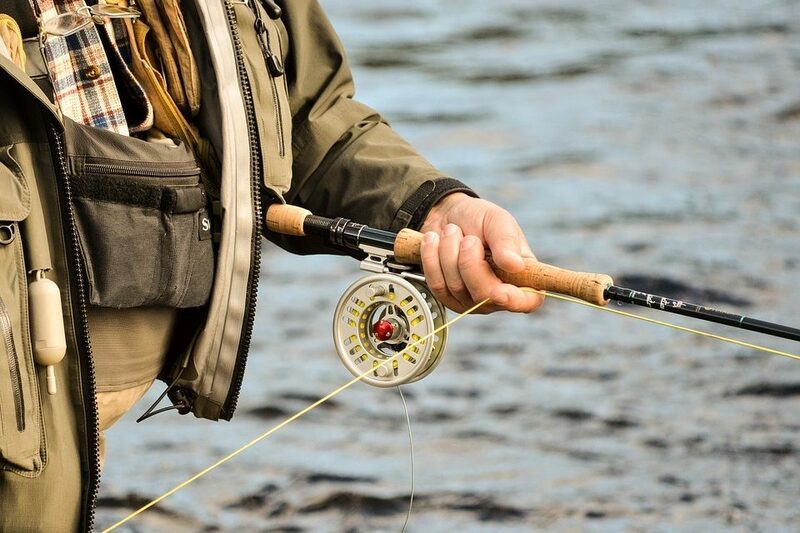 One of the golden rules of fly fishing is that if the fish aren’t biting, you should change everything else in your power before switching flies. It’s usually your presentation, location, or depth that’s killing you. For alpine lakes, I suggest bending this rule. 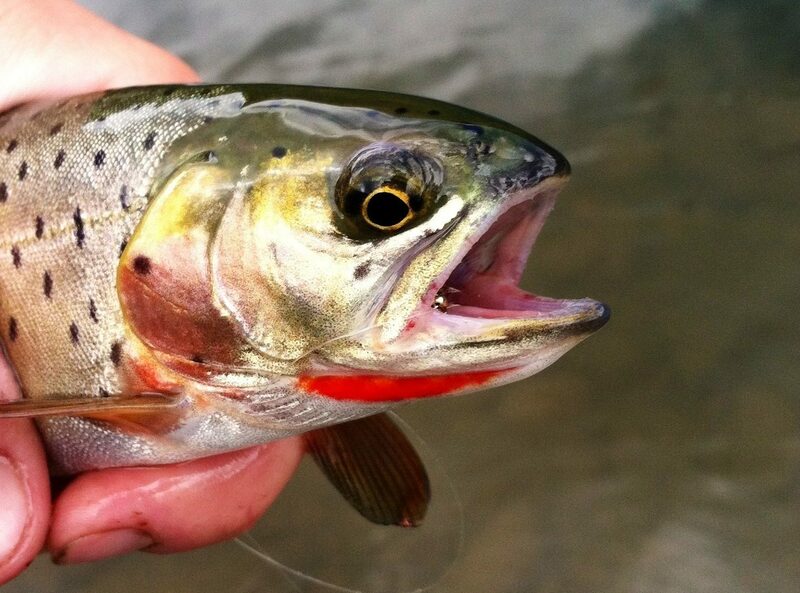 More often than not, high-country trout will not be very picky. I actually use backcountry lake trips as excuses to throw flies that don’t often get to see the light of day outside the box, such as bumble bees or tarantulas. With that being said, this mindset has occasionally caused me to waste a lot of time waiting for fish to take flies they flat out don’t want. Every so often, the fish will want something very specific, and it’s often something so small you can’t quite pick out what it is. Thick, heavy hatches are rare on alpine lakes, so it might not be apparent that there are bugs at all. When the fish are being picky in these situations, I’ve found that the best course of action is to keep switching flies until I find the one. When fishing dries on a lake, there aren’t a whole lot of options to switch technique-wise, so changing flies is one of the only things to do. It’s unlikely you’ll go through a whole box of dries without finding at least one or two patterns the fish will accept, and it’s also likely that their tastes will change throughout the day. So, when in doubt, change it out. Of course, you could try going subsurface, but we’ll talk about that in a bit. This is one of the biggest advantages you can give yourself on any lake, backcountry included. If you stick to the edges of the water, you’re restricting yourself to a very small percentage of the overall area of the lake. Not only does this limit the fish you can access, some of which will surely be just out of your reach, but, if there do happen to be other people fishing there, you will also be competing with them for the same area. Belly boats, I’ll admit, are a pain to haul, especially if you have to hike more than a couple miles with them. With that being said, there are plenty of options that are designed to be lightweight and packable, and I’m able to fit one in an overnight pack without skipping out on any of my normal fishing necessities. I usually strap the fins to the outside of the pack, but this isn’t much of a burden. 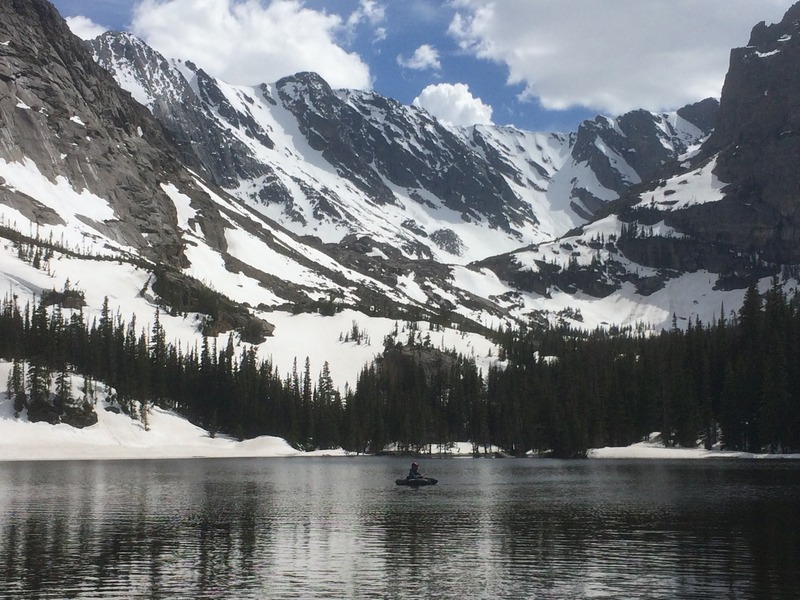 The obvious advantage of bringing a boat is accessing deeper and more remote parts of the lake, but another benefit that’s often overlooked is the ability to fish back toward shore. Fish often cruise the edges sipping easy prey off the surface, and you have probably seen them as you fish along the bank. The problem is, they can also often see you and will either refuse a fly or leave the area altogether. Belly boating allows you to target these fish from within the lake without causing a disturbance on the bank. Along those same lines, you will be able to access shoreside areas that are impossible to reach on foot due to thick brush, fallen logs, or other obstacles. Fish that might be lurking under a low-hanging tree branch in thick timber will no longer be out of the question. It’s not often that we get to throw beetles and ants in moving water, but alpine lakes are perfect for them. Take this opportunity to toss terrestrials you wouldn’t normally be able to use. They are usually made of foam and float easily, so you won’t have to struggle with keeping them on the surface. Their conspicuous shapes will also be easily detectable by cruising trout. Therefore, you’ll often get a take after just a few seconds. It’s also just a great time getting to experiment with flies you normally wouldn’t tie on. Like I mentioned before, bumble bees are one of my favorites to play around with. The classic low-elevation stream fishing trip usually goes something like this: get up early to fish, nymph until late morning, nap until the hatch, then throw dries. If you do that on a high elevation backcountry lake, you’re missing out! Not only do these trout often accept dries any time they feed, but they also usually feed throughout the day. If you have to factor in a long hike to get to your destination, you probably won’t start fishing until late morning anyway. I usually find this to be no problem, as trout will be eagerly feeding into the afternoon. If you want to take advantage of this, skip the nap. I don’t mean ditch bringing your gear. That would be bad. But, consider leaving some of your luxury gear on shore while you fish. Unlike fishing in a stream, in a lake you aren’t necessarily moving in a steady linear direction all day. You don’t have to worry about walking too far from your gear by accident, and you’ll most likely be able to see your gear even if you do stray. Ditching gear like your fly pack, fly boxes, leaders, and tippet can free up your wading in a lake. You can wade deeper, avoid getting line hung up, and generally feel more comfortable with just the essentials like nippers and forceps. For anything else, you can just pop back to shore. And, with fewer obstacles like trees, it’s unlikely you’ll lose flies to snags anyway. Leaving your gear on shore probably isn’t going to make or break your fishing game, but if you are able to wade more freely and skip messing with extra gear, it can only help. This is a big one. It’s amazing how many lakes are “paired up” with other lakes just next to them that you can’t see through trees or over ridges. What’s even more surprising is that sometimes one of these lakes will fish way better than the other. Scouting on Google Earth or looking at maps before you set out can let you know if there are actually multiple lakes where you’re going. If there are, there’s no reason not to fish both. Without prescouting online or on paper maps, you could miss a perfectly good hidden gem near your destination that could actually prove to be more productive. In doing the research, you might also come across tips that other people have left on forums to give you the upper hand wherever you’re going. 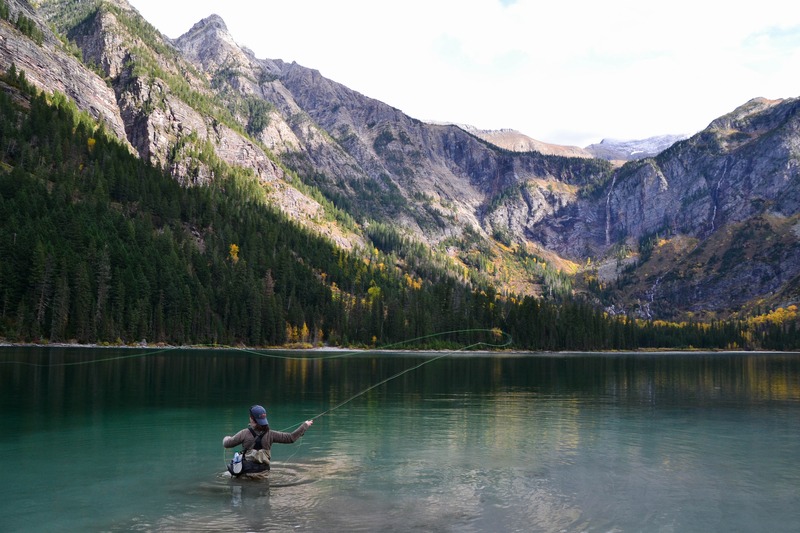 I know I implied that alpine lakes are a dry fly fisherman’s best friend, and they are, but they are also a dry-dropper fisherman’s best friend. Fishing a dry-dropper rig in fast-moving streams can be annoying if you don’t have a particularly buoyant top fly, which isn’t always ideal if the fish are eating small insects. Since there’s no current in a lake, you can get away with fishing a wider range of dry-dropper setups while still using the dry as an effective indicator. Although fish often rise on these lakes, that doesn’t mean they won’t stop on their way to the surface to grab a nymph. And, fish feeding subsurface will also have the chance to hook up. If fish stop rising altogether, you can strip a single nymph underwater to entice finicky trout into giving chase. This can be a fun way to watch fish chase your fly in glassy water. Whether you’re on a weeklong backpacking trip or just hitting the trail for the day, consider trying a few of these tips out to make the most of your day on the water. Where will your next backcountry adventure take you? If you learned a thing or two from this post, check out my list of 11 Tips to Catch More Trout in Small Streams. 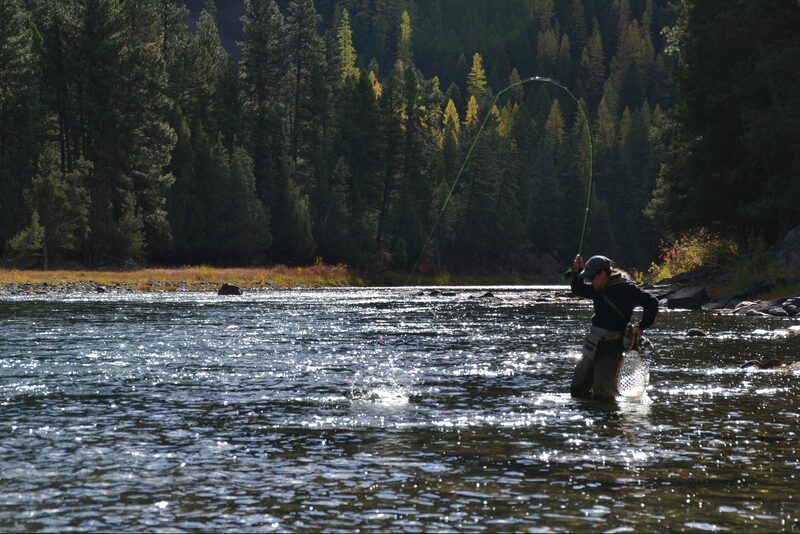 Previous PostFly Fishing Terminology: You’re Casting a What? Next PostWhat is the Dingell-Johnson Act?